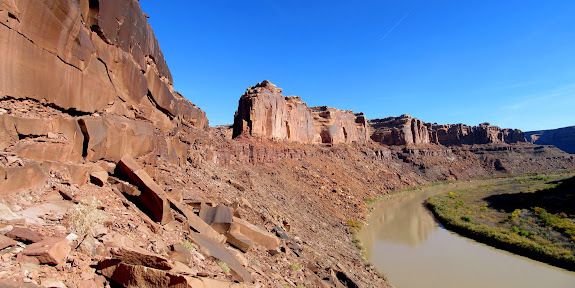 There’s an old stock trail in the right fork of Twomile Canyon that connects the highlands of Keg Point to the Green River in Labyrinth Canyon, 1,200′ below. It’s one of relatively few places to access Labyrinth Canyon from the rim. Several months ago Wade began planning a trip down the trail to the river, then upstream along Oak Bottom, ending with a climb up to Bowknot Saddle to see some historic inscriptions. We set a date about a month in advance of the trip and, on Saturday morning, met near Keg Knoll where most people start their hike to Colonnade Arch. Alan rode with me from Price, and we met Wade and his family along with new hiking buddy and history buff Lyman. We set out across the slickrock to the northeast and in a short time located a cairn marking the top of the trail. A break in the cliffs led down to a short section that had been blasted out of the sandstone. There were a couple of short, constructed switchbacks before the trail turned west and leveled out. It then descended a long and rocky talus slope to the bottom of the right fork of Twomile Canyon. It took us an hour and 40 minutes to hike from the vehicles to the bottom of the canyon, where we rested up a bit before moving along. The hike down Twomile Canyon was fairly level and easy. A few of us spread out and we checked the large boulders in the canyon’s bottom for rock art and inscriptions. We found a few modern names scratched into the sandstone but one 1901 inscription stood out: J.W. Shand from Manti, Utah. At the mouth of Twomile Canyon we turned northeast and hiked along a flat bench above the banks of the Green River. It was easy hiking and there was even sort of a trail along most of the bench. We reached the lower end of Oak Bottom and that’s where it got a little difficult. Oak Bottom is completely choked with trees and brush between the river bank and the talus slope at the bottom of Labyrinth Canyon’s vertical walls. Our only real option was to scramble across the rocky talus for about a quarter of a mile until the brush eased and we were able to walk on the relatively flat flood plain. In the less brushy section of Oak Bottom we encountered a large boulder with the names of several sheepherders carved into it. Near the upper end of Oak Bottom we were surprised to find a rock with the initials of the “Lucky Thirteen,” a group of early river runners who later completed a trip down the Colorado through the Grand Canyon. Oak Bottom pinches out to nothing at its upper end, just below Bowknot Saddle, which is where we began our ascent. The original route up that we’d planned looked impossible from the bottom, so we spent a lot of time scrambling up and down looking for a break in the cliffs that would lead us up to the saddle. A couple of us (myself included) were getting a little exhausted, and it was already late enough in the day that we were certain to run out of daylight for the return trip. Wade kept at it, though, and finally found a route to the saddle! Lyman and I were the only ones to follow. Wade guided us up from above and we met him near the inscriptions that we came for. There were names from early explorers, miners, and river runners, with dates ranging from the early 1900s well into the 1940s. We spent less time at the saddle than I’d hoped for, but we really had to get moving back. During the hike back my legs started to cramp, and I began to seriously worry about whether I’d be able to climb back up the trail. Just while walking across the flat ground along the river I had to take a couple of breaks to wait for leg cramps to lessen. Surely the steep climb up the trail in Twomile Canyon would kill me. I plodded along very slowly up the trail, and somehow I made it to the top without my muscles cramping up. Before reaching the top of the trail it got dark enough to require the use of headlamps. I was the last one back to the vehicles–glad that it was over, but even more glad that I went. Dennis — This story and its photos are some of your most amazing work. Your contribution to our documented history will become invaluable to the next generation. I probated the Chad Moore estate. I am forwarding your link to his family. Beautiful, interesting and enjoyed the tour. What an amazing hike. Dennis, do you have the GPS coordinates for accessing the rim? We are planning a rip down the green river and plan to hike to Colonnade Arch from below. We are hoping to know where to access the plateau above without a lot of guesswork. Besides the Arches and Crocodile Rock / Dragons Teeth, should I be looking for anything else? I will have hiked BowKnot Saddle the day before. I don’t think there’s much else out there. There are a couple of inscriptions on some boulders in lower Twomile Canyon, but they’re not particularly significant.